There’s an hour before bedtime. We call it crazy-hour in this house. This evening it was marked by the two boys running around in circles, shouting and giggling. All I can do is watch and embrace the madness. As himself doesn’t get home until close to bedtime it can be hard to try to eat a full dinner while the crazy-hour is underway. I try to eat my main meal during the day with the boys and then have a lighter supper after they go to bed. That’s the idea behind this warm prawn salad. The only thing I need to remember in advance of making this supper is to take the prawns out of the freezer in the morning. I’m on a budget. There is no way I’d be able to afford fresh prawns on a regular basis. I buy a large bag of decent frozen (uncooked) prawns about once every 2 months. There is plenty in the bag to do us as the kids aren’t quite appreciative of the flavour just yet. Actually if you do buy fresh prawns in the fishmongers you’ll know that they are frozen from the point of catch anyway so there is a possibility that the prawns from the freezer could be fresher than those you buy defrosted at the counter. There are 2 elements to this speedy supper. The first is the Spanish -style flavouring that you cook the prawns in, and the second is the speedy pickle that I use to add a zing to the dish. The spices must be dried for the authentic flavour, which reminds me of chorizo, so it’s handy to have a store cupboard fallback. Take a large frying pan on a medium heat, pour in the sunflower oil and then melt the butter in the hot oil. Sprinkle in the dried garlic and paprika. Allow to toast in the oil for 30 seconds. Don’t stick your nose over the pan or you will get a fit of coughing! Toss the prawns into the pan and allow to cook for 4 minutes each side. Until they are pink and cooked through. In the meantime, cut the cucumber in half and remove the seeds using a teaspoon. Shred the rest of the cucumber and combine it in a bowl with the vinegar, salt and pepper. Once the prawns are cooked through. 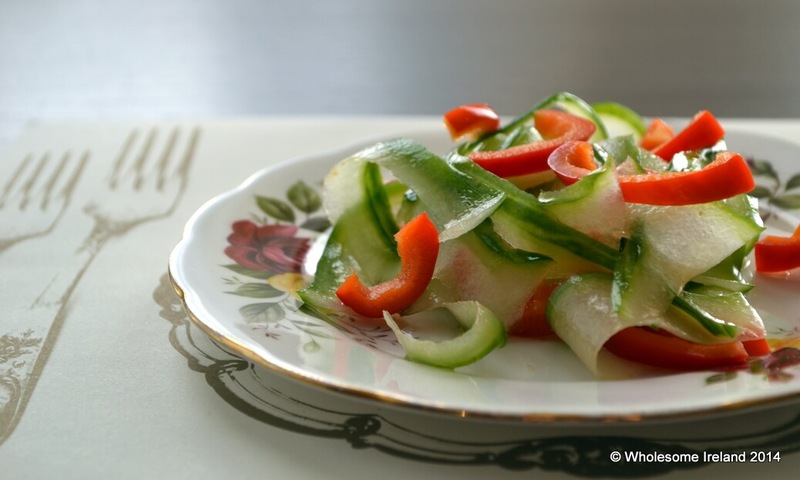 Serve on a bed of the pickled cucumber with the sliced red peppers. If you would like a carbohydrate with this salad then a hunk of crusty bread would be perfect. Yummy! I’m with you – that bag of prawns in the freezer goes a long way as an occasional treat. And I love quick pickles. Don’t get me wrong, I like a slow fermented pickle too but I love the freshness of a quickly pickled piece of cabbage or cucumber. Yum! Killing me here with the pickles. Love it! Is it possible you could hint at where you bought the prawns Caitriona? We’re big fans, but Ive only ever bought cooked. I get them in Lidl, in a large bag. It’s white & it’s from their Deluxe range. I hope that’s some help to you! Thanks. I’m a Lidl fan too, I’ll look into it.